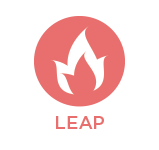 The LEAP – LIT – Leaders in Training and CIT – Counsellors in Training programs are designed for campers 12 to 16 years of age who are preparing for their first volunteer and or work experience. Participants will learn about what it takes to lead, how to work effectively in a team, effective communication, behaviour management and much more. Participants will still enjoy regular camp activities such as zip-lining, archery, swimming and drumming, plus they will organize and run our campwide activities every Friday! Our goal in this program is to build both confidence and character through group activities and workshops that are hands on and most importantly engage all. Participants will get the opportunity to interact with children and work with a mentor counsellor to help guide them to effective leadership. Earthbound is excited to present our LEAP-LIT program for 12-13 year old youth. This two-week program allows LIT to participate in all their favourite camp activities, however they get to take on a bigger role in each one and learn how to effectively run the activity. In LIT we introduce concepts such as positive communication with youth, proper counsellor behaviour and responsibilities, and have an open discussion on these concepts. LIT get to dip their toes into working with children as they will be given the opportunity to volunteer with one of our mentor counsellors. LITs will be trained in First Aid and High Five Principles of Healthy Child Development. To celebrate their success, a family BBQ evening will be held on the Thursday of the second week. This program is a prerequisite to the LEAP CIT program. Earthbound is delighted to announce our new LEAP CIT program for 14-16 year old youth. CIT aims to continue expanding and growing the knowledge and experienced learned in LIT and to take this to the next level. This two-week program will consist of leading base activites, conflict resolution training, goal setting and personal reflection activities, and resume building. During the second week, CITs will be placed with a mentor counsellor during transition periods and will be given the opportunity to program and run an activity for a camp group. CITs will be trained in High 5 Principles in Practice, and will be re-certified in First Aid/CPR. On the Thursday of the second week, CITs are invited to an overnight camp out at the farm. After completing this program over a two year period, the Counsellor in Training will be evaluated and could be provided with an opportunity to return as Staff the following year at the age of 16. Pre-requisite: LEAP Leaders in Training program or equivalent LIT program from another OCA camp. For more information regarding LEAP, download our LEAP Program brochure!